Ships from Hong Kong. Ships from Hong Kong. 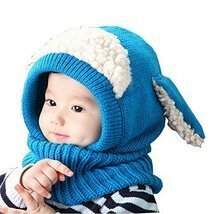 This hat is a must have item in winter for your baby. It is both beautiful and useful. It is warm enough to prevent your baby from cold. One size fits for most baby. This hat suits for 46-51cm head circumference. The length is about 50cm and the width is about 24cm. Please select the best fitness size for your baby according to the head size.